You love the feeling of sand touching your feet at a beach on a holiday, where the sun kisses your skin and cold breeze sings a tune as if only for you. The beauty of the beach gives a feeling of calmness but imagine being in a luxurious yacht in the middle of the sea with your spouse or friends, something that would leave you mesmerized with a feeling of eternity. For the people who love watercraft and for the people who are the owners of different kinds of watercraft, boat / yacht rental app is a marketplace that brings both closer to each other. The peer-to-peer boat / yacht rental marketplace is very helpful for both owner and renters. People looking to rent, charter or crew watercraft of any kind now have a new place to look for. You don’t have to take time out of your holiday and open up a laptop or computer to search for a company to rent any watercraft, when all you have to do is take your mobile phone and get going! Well, you are not going to go boating daily so purchasing just don’t make a sense, renting it out does, right? Search made easy:- With the app you don’t need to go anywhere. Just log in and browse through the list where you can find the type of boats –kayaks, yachts, sailboats, luxurious catamaran, powerboat, etc with or without crew or captain only. You can also get information on the exact name or manufacturer. You get to see the number of choices which otherwise you won’t get in one place. Complete Information:- You can get the complete information about a particular watercraft which you are looking for- pictures, specifications, location, descriptions, price, and availability. This makes it easy for you to select the one that took you heart away, without compromising with the choice. How it works:- It’s easy you see! You need to log on and enter the name of your location, along with the date when you are likely to rent a boat and you will be served with the complete list of the boats available. Submit your reservation request from inside the app. You can select option for hours, day or a week you would like to rent the boat. Pay for the rental securely online. You can also communicate with the captain or the concerned person directly to tailor your trip. Best Deals:- Now the real time availability of the attractive offers, special price, one-way offers, and special availabilities is right in front of you. You can check and make the best use of it. Boats Near you:- With the help of geo-location features you can check for the boats that are available near you. This will save time and you can book and avail the boat without wasting much of your time. News:- This added feature can provide you with all news about the yacht, boats and other watercrafts so that when you are at a particular place you know what to do the next and which boat or yacht to hire for the best experience. Map based app:- This add-on in the app lets you calculate the distance, routes, timing even before you are at your holiday destination. Reviews:- Review your trip with photos with your family and friends or on social media networking sites and let them know about your amazing experience. They can get a number of choices at their chosen destination, at the tip of their finger. They don’t need to go and spend their time searching for the boat while on holiday. They can also plan and book the watercraft even before they are at their destination. Attractive last-minute packages and deals. Increased transparency and efficiency as the boat owners now know that there will be reviews. A happy customer means a good publicity through word of mouth. And the best thing is that renting a boat via boat / yacht rental app is cheaper than renting it through a traditional rental company or broker. Boat owners use their boats for just 15-20 days a year and spend a huge amount on their maintenance and storage with no way to offset their costs. The Boat rental app gives them an opportunity to earn more money around the year and increase the profit. This would also make the luxury boats and yacht available for everyone, earlier only a dream for many. List your Boat:- Owners need to list their boats and yachts on the app and add the full description, specifications and great pictures. That’s very easy and won’t take much time. Booking:- Whenever a renter selects your watercraft and pays for it, you get the booking request in the email that you need to reply for within a time limit, say 24 hrs. Payments:- The payments are transferred securely to the owner’s account and also the policy for cancellation is available which meets the requirement. Meet your guests:- You can meet your guests, tell them about the rented yacht/boat and brief them on safety measures. Review:– Well, you get this beautiful option that lets you share your experience with the renter. That would make you more interactive with your potential customers. Through the app, you are always in the eye of one or another customer. Owners get new a source of customers and the extra money they earn to offset ownership costs. Insurance in the total rental cost or thought third-party links can be provided. Also, hull damage protection, towing facility, on-water supports can also be included so that owners don’t need to worry about the safety of their rented, chartered or crewed boats. The boat rental app is definitely making boats accessible to more people and more people considering the watercraft means more business. It’s the era of mobile apps and everyone loves if you are available just there right in their mobile. 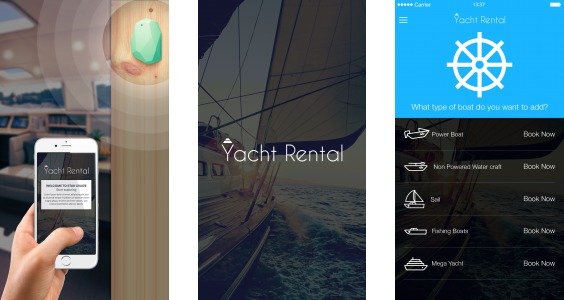 The mobile app development companies are coming up with the amazing apps making it the next new big thing in the sharing economy and getting your boat business listed on the boat rental marketplace will make you ahead in the line. The app not only provides you the place to earn that extra cash, but it reduces the risk, provides transparency and payment security. There is a tremendous increase in number of people taking to water for number of reasons- hosting an anniversary party, corporate party, fishing, skiing, leisure family holiday or a romantic cosy ride with their spouse; and for all these activities all they need is a superb watercraft that they won’t consider buying but renting it out. Contact us to Get your boat business on the boat rental marketplace and let it grow.